Q. So you're the person that takes the photos for the website? How did you get that sweet gig? A. Well - it sort of came with the rest of the job as being the person that processes everything, writes the descriptions, and gets it onto the website. You gotta have pictures ... .
Q. Absolutely. Walk us through the process - what goes into photographing a bead? 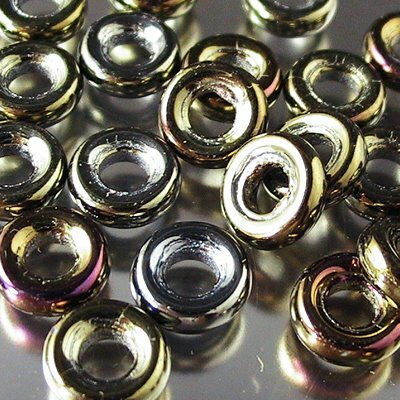 A. I start with a box of beads - usually all from one wholesaler. I'll empty the box and sort it, and get a sense of what I need to do. If it is all consistent items, say, a new shipment of Swarovskis where it is two or three shapes in a rainbow of colours - then I sort them. A. Well - it's much faster to process them afterwards if they are in some sort of order. Q. Fair enough. Then what. Q. Wait a minute - the invoice? the package? Yep - it's how I can be certain that I match up the correct product with the correct information. That's one of the reasons why I love digital photography - you can use photos to store information like that. I take them out of the package, arrange them on a stage, shoot them, and then re-package them. That sounds like less fun than I imagined! Well - I'm pretty sure that if I dumped them all loose in a box - the gals at the store who then have to re-package them for sale would kill me! How many pictures do you take of each item? One or two? Five - fifteen - more. As many as it takes. Depends on how cooperative the bead is being. Really? Then you must take a lot of pictures. Yep - 500 - 700 in a day's shooting is not unusual. Wow. Do you have any tips for the rest of us who are trying to improve our own picture-taking? Well - I have some specific and concrete tips, or I have a general philsophy. Let's hear the specific tips first. one - Get the subject in focus. four - take LOTS of pictures. Is that it? That seems pretty simple. Nothing about f-stops and aperatures? Yeah - that's it. 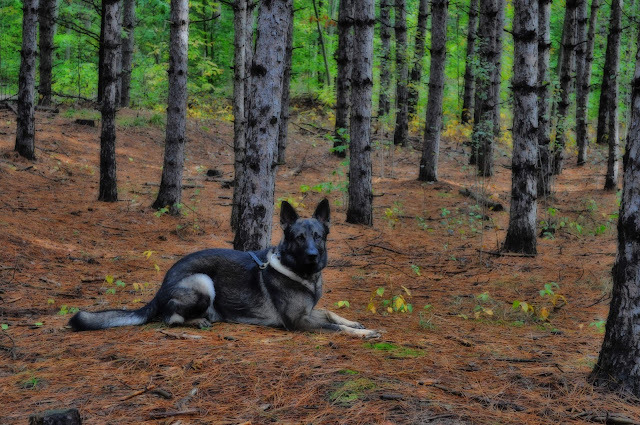 Look at the picture enlarged - find out where the camera focused. Not on the background, hopefully. "Take lots of pictures" is the most important. I find that if you take lots of shots - your chances of having one good one are much better. The focus may be a little out on one, or, you might move the item and the light hits it a little better. I use 3 lights, and I often pick one up and move it around as I shoot, looking for the most flattering lighting. You make it sound like you are shooting portraits! That's actually how I think of it - bead portraits. I'm trying to capture the character of the bead - not just a product shot. Geez - there have been soooo many! I'll fall in love with one for awhile - but soon, there will be another, better one. I will say though - shooting the really big Swarovski pendants in Crystal AB is always a treat! How can you not love those colours! 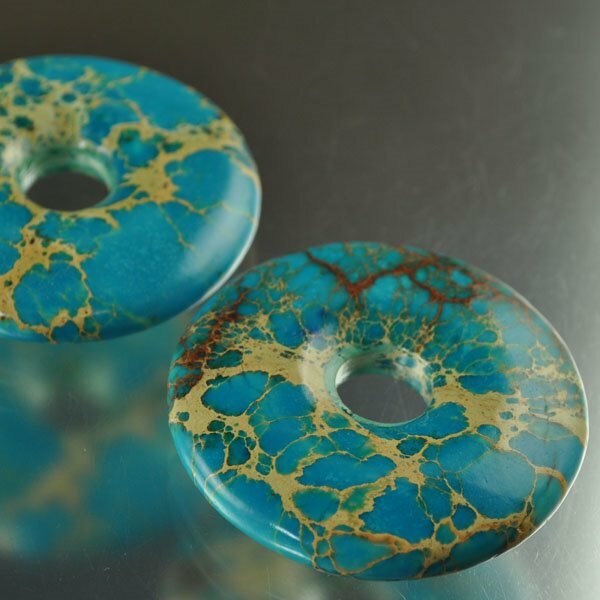 And matte finish beads seem to be particularly photogenic - I really loved the way these came out. So if that was the specific tips - what about the "philosophy." OK - I heard this from another photographer a long time ago - and it helped me a lot - but I'm not sure that it will help anyone else. What he said was, "Don't shoot the object - shoot the light." I spent a lot of time thinking about that - I still do think about it. Oh - and the other thing is - keep at it. Practice, practice, practice. Hmm - some colours are hard to capture accurately. I've found that you get a truer red with a black background, sapphire beads look like cobalt, and cobalt beads are just impossible to shoot. They never look right. Can you show us a picture of your set up? I bought the entire set up from Table Top Studio. Geez - that's - um - kind of cluttered. True - I said the photo should be uncluttered, not your desk. But notice, it's well lit and in focus. ;-) Also - I took two photos - just to make sure that one would be ok. And if they both sucked, I would have gone back and taken more. And what kind of camera are you using? A Nikon D5000, with the stock 18 - 55 mm Nikon DX lens. That's a pretty high-end camera, is it? No - it's what they call - "Pro-sumer" - somewhere between amateur consumer and professional grade. The enthusiasts' camera, I guess. Do you take photos for fun as well? What kind of photos are those? I like to shoot a lot of sky and scenery shots - and I use the camera a lot to take photos of dogs - mostly casual or action shots. I like to capture the moment - not stage it. Can you share some of those with us? OK - here's a couple of favourites. What do you like about these two pictures? The first one - the silhouette - captures, for me - that bond, that partnership - between a dog and his human - plus - the sky is just great! There is the awesome sunset - and a sun pillar in the background too as an added bonus! Well - thank you for your time. I think that wraps it up for now! If you have any questions for our photographer - post them in the comments! 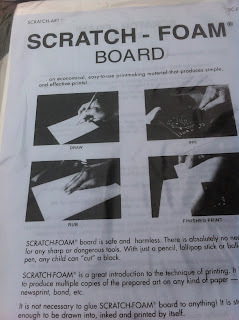 I bought some Scratch-Foam Board to try out as I have heard it is a quick and easy way to make your own textures. 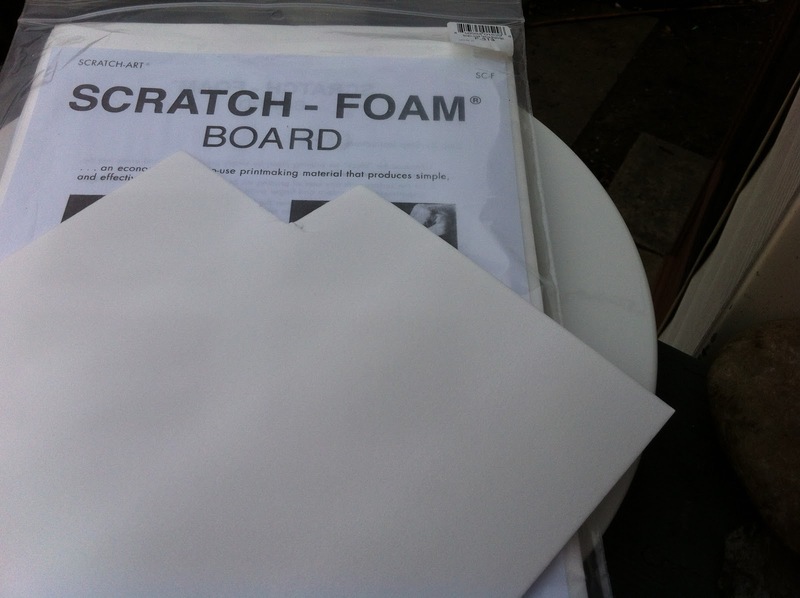 It a thin white foam board that you can easily "scratch" your texture onto the board. The instructions say " With just a pencil, lollipop stick or ball-point pen, any child can 'cut' a block". I tested it and it really is that easy. My fish bone print. I hope to use this with a pottery dish I am going to be making for my cat. A random heart print. I am not sure if I like this one. I may work on this one a bit more. Personally, I would prefer that the print could make an indentation rather that be raised but I imagine I could reverse the print using an alternative medium such as a molding compound or polymer clay. The Business Chat - You're in the drivers seat. It’s that time of year again. No, not the I-can’t-believe-I-ate-all-that time – it’s that time where everybody starts talking about resolutions. Ho hum. We make them then we break them, both personally and professionally. It’s darn easy to be sitting on the couch with a beverage and some chocolate and talk about all the great things you will do for your business starting on Tuesday January 1. Until that alarm clock goes off on morning of the 1st and it goes downhill from there. So this year don’t even go there. No promises to faithfully blog twice a week. Or to tweet 10 times a day. Or to build that new website by January 15th even though you don’t know how to code. Stop right now. Although I think resolutions are stupid, I do believe that intentions and goals are the key to success. Imagine getting in your car and having no destination. You just randomly drive and drive. You get nowhere. Occasionally that might be what you want to do but on a daily basis? It’s no way to live and it’s no way to succeed in business. You are in charge of where you are going. You decide. It’s your business, you make the calls. Sometimes life will throw a curveball at you and you have to change your path (hello recession!) but ultimately it is up to you where your business will go. I want you to stop and ponder this for a bit. Grab a notebook and a pen. (What, Santa didn’t bring you a new notebook?) Really spend some time on this one because this is super important. This time next year what does your business look like? Here’s your homework. Write a letter about what 2013 brought you professionally. Then describe your business as of December 31, 2013. As you write this you may notice a little voice in your head saying stuff like “you can’t do that, you don’t know how”. Or you may finish every sentence with a “but” and a reason why you can’t. Do not listen. This is an exercise in possibilities. Your inner critic has no place here. Think about what your work will look like. Did you create a solid body of work? Maybe you built a good collection. Or took some great classes and learnt a new skill. Think of what your work space will look like. Will you work alone at home, or in an outside studio? Do you have an assistant? Where will you be selling? Did you do any craft shows in 2013, if so how many? How did they go? Maybe you finally got a new website or opened an Etsy shop. Speaking of sales did you hit your target numbers? On December 31 2013 what do you want your business to look like? (found in a shop window on Queen St West, Toronto). It's hard to believe that 2012 is almost over. And what a year it has been at beadFX! There was THE MOVE to end all moves. All those beads and goodies that were packed up, moved over and unpacked. It was really a group effort and wild when you realize that the store was closed for less than a week! Then there was the inventory of every single item in the store....that was quite the job and a big thank you to everyone who came out and helped with that endeavour. The new store, for those of you who haven't been in to see it, is about three to four times bigger than the old store. There is a room full of Japanese beads - Miyuki and Toho's - and all sorts of stringing materials and needles to go with the beads. And of course the Kumihimo disks and accessories are there too. There is another room filled to the brim with Swarovski crystal beads and pendants, pearls, hotfix and flatbacks, chatons and rivolis and oodles more. I keep thinking we need to hand out sunglasses when you enter that area. The beautiful classroom, the metal working studio and the lampwork studio. The trifecta of learning rooms at beadFX. So much bright light infuses the store, from the moment you step inside. There are glass cases filled with samples of projects to be made in the many class offerings on the calendar. There are also glass cases showcasing the latest trends in the industry and what new products beadFX has to offer. There are many cases filled with beautiful jewellery from the Inspirations that are posted every week. There are so many more books available in the two huge book racks that are new to the store. There are also tables full of artisan made lampwork for you to drool over and of course, buy to make something special from. We have lots planned for 2013.... lots of exciting, sparkling goodies and events. 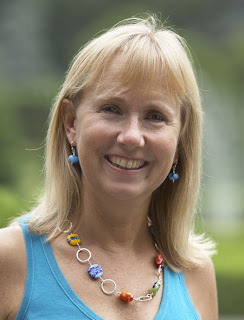 Book signings, staff appearing in magazines, "celebrity" teachers from near and far. From our beadFX family to yours, we will you a 2013 filled with lots of sparkle, health, happiness and of course beads. No new stuff this week - so we thought we'd do a little recap of last year and give you a peek into the future as to what is coming up in the new year! About this time last year, we were madly packing - as we were moving into new premises. We doubled our floor space, increased our back office/counting/packaging/shipping area, and added a big classroom, a metal-smithing studio, and a redesigned, state of the art lampworking studio. Around the middle of the year - we installed a new point of sale system in the store for faster and more accurate checkout, and which finally, finally, talks to our website, which means that our incidence of items showing as being available online, but actually being sold out has dropped right off. Less frustration for all! We also saw some new ideas in jewelry making, like the embossing tools, Regaliz leather, the Mirrix looms, and the Soutache. We added over 3200 products this year - all individually photographed and described. We don't believe in using stock photos that show you "one bead," or worse - show all the sizes as the same bead, enlarged. We also believe in supporting the small wholesalers, who aren't in a position to provide photos, or have one-of-a-kind items that you just won't see anywhere else! This coming year - we're going to be giving the website a major facelift that will give you modern features that we have all come to expect from websites - like better search function, more consistent navigation, choice of sort order, zoomable pictures, saveable shopping cart, (and easier to use! ), access to previous orders, view status of orders, and a bunch of other friendly features that we don't want to say anything about until we test them! 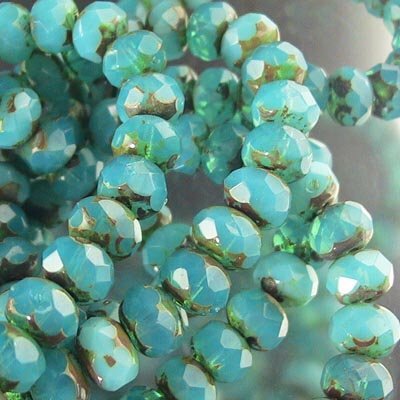 As for new beads - in the immediate future, well - more Swarovski's. That's a given. I see Freshwater Pearls in the near future. More metal, ooo and some vintage beads that we don't want to reveal the nature of yet. Spoil-ers! And that's just January! Our buyer is already planning her trip to Tucson in February to pick up fabulous goodies for you, and plotting and planning to find the greatest and most inspiring stuff! So - while 2012 was fabulous - we're really excited about 2013. It's going to be Awesome! We are CLOSED straight through until the new year - re-opening on January 2. This gives everyone here a chance to have some quality time with their family, reacquaint themselves with the strangers with whom they live, and generally just recharge their batteries. However - we are carrying on our tradition of giving you 12 inspirations over the 12 days of Christmas. This year - Stephanie has agreed to do the 12 days of Christmas jewelry - with the theme of "Bling in the New Year." We await her creations with breathless anticipation! 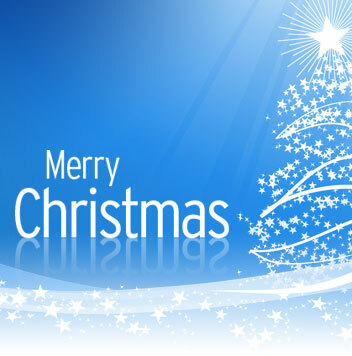 So - from all of us - to all of you - we wish you a wonderful and happy holiday season, and may all your wishes come true! by popular request - we're running this post again this Christmas eve. Last week I mentioned that I got the QuikArt Standard Stylus (from Art Clay World USA - retail $5.79) to use to cut stencil shapes with metal clay (I usually use a pin tool rather than a craft knife; often, I find mya craft knife will accidentally notch the clay). This week I managed to test the QuikArt Stylus. I compared it to my favorite pin tool, the Ultra Clay Pick (which I bought from Cool Tools US - current retail $11.97) and to an Economy Needle Tool (I picked mine up at a pottery supply store for a dollar or two). Above is a photo of the results of using each of the tools mentioned above to cut out a curved leaf shape. The far left was the needle tool. 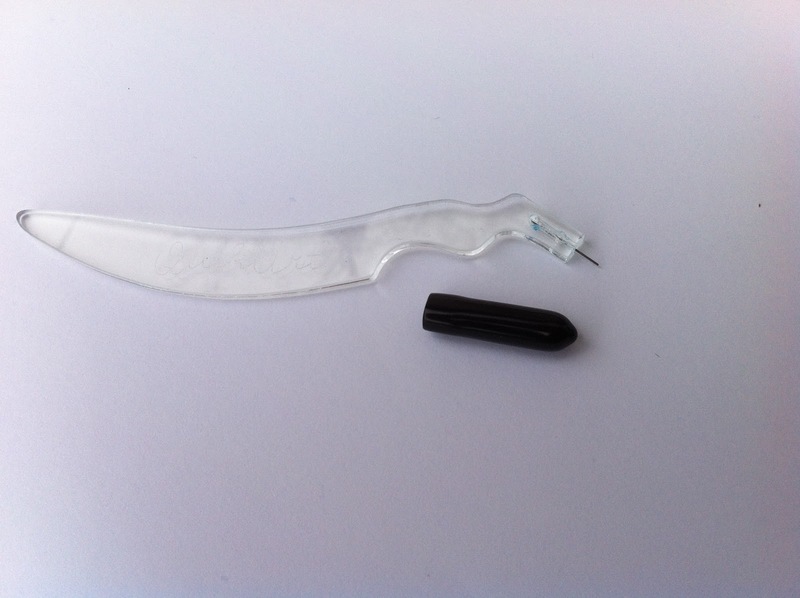 In my experience the needle tool is the least effective is cutting and leaves a very jagged edge compared to my Ultra Clay Pick and the QuikArt Stylus. It may be hard to tell in this picture but the edge it the most jagged. The piece in the middle was cut with the Ultra Clay Pick. I still love this tool as it is sturdy and I am used to handling it. I gives a cleaner edge to the needle tool. The piece on the far right was cut with the QuikArt Stylus. It seemed to produce the cleanest cut. I think this would be especially useful for intricate stencils. Overall, when testing it numerous times I didn't find a large difference in the way the Ultra Clay Pick and the QuikArt Stylus cut the edges. I am used the the feel of the Ultra Clay Pick in my hands and the QuikArt Stylus was a little different to get used to. Its tip is fine and I am a little nervous it may get bent or broken if if it the cover is not put back on it (which knowing me may actually happen in a rush). Given the price point, I think the QuikArt Stylus is worth a buying, but I am still quite fond of my Ultra Clay Pick. For those who are new, the other essential cutting tool is of course a craft knife. Remember to keep your craft knife blades sharp as the dull blades leave to pool cuts. Also a note about the pieces above, I did not finish them because I wanted you to see a fresh cut. But after you cut a piece remember to run your finger around the edge to soften the imperfections before the piece dries. 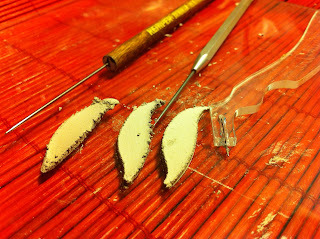 Another side note, it that I used reclaimed clay for this test which can lead to more tears when cutting the clay. For the smoothest edge use fresh clay. Well I don’t know about you, but on December 23 I have to say that business is one of the last things on my mind right now. Even I, as a hard-core seller am done with it for the year. At least I’m done with all the making, selling, photographing, writing, admin-ing, social media-ing work of running my business. There is still one last task to do. It’s a fun one (depending on your definition of fun). My last task is my annual review. My review is not just how I functioned in my “job”, or how well the “company” did, it’s also about setting goals and milestones for the upcoming year. No matter how small your company is I think a review is critical to your future. A review allows you to see exactly where you are now so that you can map out how to get where you want to go. I must admit, being December 23 and being surrounded all this holiday festivities, I had a hard time concentrating on this task today. And so I decided to just work on one small part of this for this week. I’d think this is something every single person should do. Take a few minutes to think about this. Make a list. Now is an excellent time to celebrate everything you have accomplished in 2012. When you work for yourself there is no one to give you a performance review and tell you how great you are except yourself. If you are like me, you have a to-do list the size of a phone book (I am assuming that you are old enough to remember what a phone book is). It’s a very natural thing for us as small business owners to only ever look at all the things we haven’t managed to do yet. It’s time to give ourselves a pat on the back. Let’s spend this pre-Christmas time focussing on the positive and celebrating all the things we did manage to do. Go ahead. Write them down each and every single accomplishment no matter how small. Think of new skills learnt, books read, knowledge acquired, tools bought, sales made, everything positive you managed to do in 2012. I’ll bet it’s a bigger list than you realize. It’s a nice way to end a year, celebrating how much you managed to do. Now, don’t you deserve a treat for being for fabulous? I thought I would post some of the products that I picked this week for our new feature on Facebook - The Dixon Chick Pick of the Day. Every day I share one of my favourite items available at beadFX. I realized that not everyone who reads our blog may be on Facebook. I could not deprive our faithful blog readers, so I thought I would share some of my MOST favourite picks. I won't be blogging again until Boxing Day, so I would like to take this opportunity to wish all of you a very Merry Christmas!!! I hope you get all the sparkles you want!!! Well, here anyway. Some parts of the country have snow and cold - Vancouver has been crippled by a staggering inch of snow - businesses are closed and the roads are a mess. But it's been insanely great weather for December here - sunny and mild. Consequently - speaking personally - Christmas has snuck up on me - yet again. Along with the apocalypse, apparently - to which I have to say - what, another one? We survived the last three end-of-the-worlds. I'm not worried about this one. If you'd like to ornament yourself, instead of the tree (or as well as) - you couldn't do much better than these Swarovski Crystal Mesh Balls. They come in Pendants, or Beads and are about as festive as you could wish for. If you need a quick gift for a friend who loves to collect Pandora charms - or any of the other compatible Euro-style charm bracelets - then check out the new Swarovski Becharmed charm-beads. Crystals, and now, new elegant pearls and classic gemstones. And, if you are planning on curling up with a seed beady project - yet more colours of the twins! We've added more happy-happy colours - which lightens up the somewhat somber collection as it first came out. We are also doing a holiday food drive. No one should be hungry while others feast - or at any other time, if it comes to that - and so we are collecting canned and non-perishable goods for the food bank. We are halfway to our goal of 250 pounds - so if you are coming into the store - please bring a can or two, some peanut butter, a box of rice - something to give a hand up. Every little bit helps! Alternately - if you're not coming into the store - we'd be delighted if you made a donation online on this page at the Daily Bread Foodbank care of team BeadFX! We will be CLOSING at 3 pm on Christmas eve - and REMAIN CLOSED straight through until the new year - re-opening on January 2. This gives everyone here a chance to have some quality time with their family, reacquaint themselves with the strangers with whom they live, and generally just recharge their batteries. Because we are closed over the holidays - and so, we have no update that week, we don't want you to feel lonely and bead-reft - so we are carrying on our tradition of giving you 12 inspirations over the 12 days of Christmas. This year - Stephanie has agreed to do the 12 days of Christmas jewelry - with the theme of "Bling in the New Year." We await her creations with breathless anticipation! As always, wonderful, wonderful new things - all over the site. I leave you to explore at your leisure. Click on a link or an image to go straight to the item mentioned above, or go to our massive list of everything and look for the "new" tags. Sorry folks - couldn't resist. "Eye Candy" - lampwork pendant and a selection of copper components, some glass and gemstone beads. All from the store. Standard pottery pin tool - I rarely use this to cut clay. I use it only when can't seem to locate my ultra clay pick which is number two as it just isn't as fine. 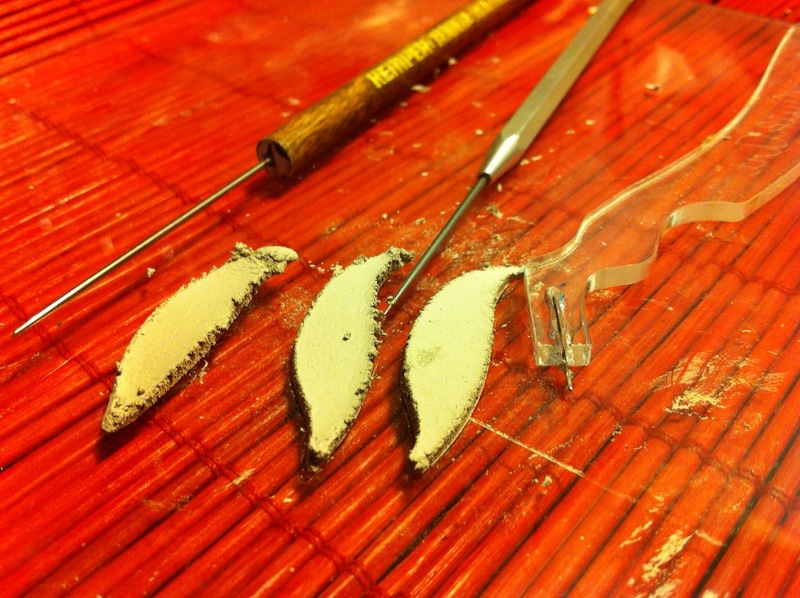 Ultra Clay - this has been my favorite cutting tool to date. I will will show you pictures next week on how it compares to my Ultra Clay pick. One more shopping week people! One last crazy push to not only get all your own shopping done, but one more week to make sales! It’s an insane time of year for those of us running our crafty businesses, we’re juggling a lot of balls right now and it’s tempting to let a few of those drop. Here are some tips to try and help you stay sane and make the most sales you can in the final push. Send out a newsletter telling your customers your LAST shipping day. Offering your customers an express shipping option (for a price) can boost those very last minute sales. Blog your final sales or shipping news. Blog or facebook quick gift ideas. Last minute shoppers are impulse buyers, give them something easy to buy. Decide if you'll be closing up your online shop for a week or two and let your customers know. If you have a calendar or holiday-themed item, make sure you push them so you don't get stuck with oodles of snowman jewelry. Share photos of your wrapped products or shipping envelopes to remind your customers they only have a few days left to shop! Remind people that you can ship to a third party and include a gift card with their choice of messages. Decide what little gift you're going to give yourself once it's all over. This might be a physical item or a nice box of chocolates or a night out with friends. Many small businesses shut down their online shops for a period between Christmas and New Years for a well-deserved break. Me, I stay open. I’ve found that I can do quite well during this period if I stay on peoples’ radar screens. A lot of people receive cash for Christmas, why not give them a place to spend it? Stay focussed people! We're almost there! And there's a couch and chocolate just waiting for me! (in January). I am super excited to share the news that the printing of the CREATE YOUR STYLE with Swarovski Elements Ambassadors' book, Crystal Jewelry Inspiration is ahead of schedule!!!! As one of Canada's two CREATE YOUR STYLE Ambassadors, I am proud to announce that one of my Sparkle Sprocket projects is included in the book. Crystal Jewelry Inspiration from the CREATE YOUR STYLE Ambassadors features projects from 25 of these talented designers from North America. The CREATE YOUR STYLE Ambassadors approach crystals from every conceivable angle in projects as diverse as the SWAROVSKI ELEMENTS they’ve used. 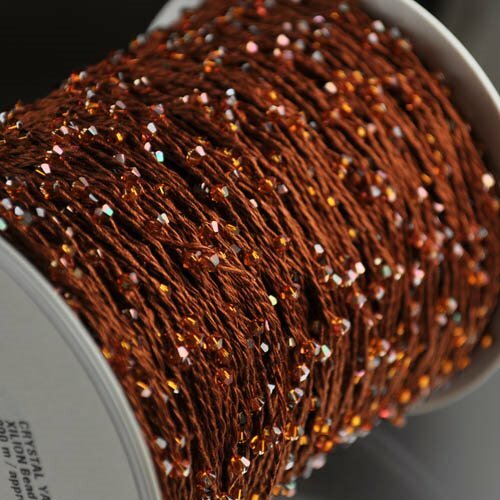 Wide-ranging techniques, from modern bead stitching and elegant stringing to intricate wire crochet, help beaders polish their favorite skills plus learn something new. Styles range from vintage to funky to show-stopping glam, all sporting the sparkle that only crystals can provide. Jewelry makers will get first-hand information, expertise, and instruction from the most enthusiastic and passionate crystal jewelry designers working today. The gallery will inspire you with projects from Ambassadors around the world. Let's see a show of hands for who wants an autographed copy???? We need to make sure that Marg orders enough copies of this, sure to be, best seller. I'll be having a book launch and mini tour, together with some special classes. We are still working out the details, but I am sure you will want to join us. Below you find the table of contents of the book. I am so honoured to among such amazing designers and teachers. I've been told my copy will be sent out next week!!! I can't wait to see it. A special thank you to the great staff at beadFX and all my amazing students from past classes. You have helped make my dreams come true. Let it Snow, Let it Snow-flake, Let it be snowflake Obsidian! Appropriate for December, don't you think? Snowflake Obsidian is a naturally occurring volcanic glass. My sources tell me that it is formed when "Felsic lava that is extruded from a volcano cools without crystal growth." Which - of course - sent me off to my good friends, Google and Wikipedia, to find out what felsic lava is. It's very easy for me to get all distracted by the stuff I find on Google, but the skinny is - when rock is molten in the ground, it is called Magma. Once it leaves the ground - it is Lava. Lava comes in three consistencies - thin and runny (Mafic), thick and gooey, (Felsic), and some that is somewhere in between, called, less interestingly - Intermediate Lava. It is the thick and gooey stuff that we are concerned with here - the Felsic lava - which has a higher content of silica, and when it cools rapidly - it becomes that glossy black stone we know as obsidian. Snowflake Obsidian is the inclusion of small, white, radially clustered crystals of Cristobalite to give it the snowflake pattern. I looked up Cristobalite too - but honestly - did not get any answers I understood - except that it is named for Cerro San Cristobal, Mexico. Obsidian is pretty cool stuff, and has been in use pretty much as long as humans have been picking up shiny rocks and hitting things, which is, essentially - always. It has been used as tools, knives, arrowheads, etc., since long before recorded history - as when it is prepared correctly, it is sharper than steel. Metaphysically - it is said to calm and sooth, and teaches you to value mistakes as well as triumphs, to let go of unhelpful mental habits and promote dispassion and centering. It also is said to have many connections to "truth" - from use in scrying to bringing hidden truths to the surface in dreaming. Design-wise - it is a handsome black and grey neutral look - so you could add small splashes of color, like red, to make it pop, or go with a classic look in the same palette. 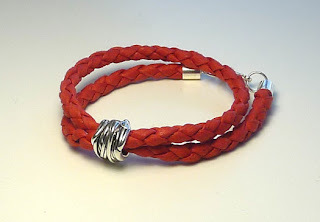 Try it with Swarovski Crystal Silver Night to stay with the same colours and add some sizzle. If you are looking for something funkier, with more drama than escaped dachshund and a coffee table full of appetizers, I suggest you take a look at these Quartz Crystal Spikes. Each of them, the Gold and the Iris, have been gussied up, in much the same way as AB beads are blinged up. And, finally if you are a fool for tools, then you should know about these four new tools. These Serrated High Durability Scissors are for cutting through those uber tough stringing materials like Fireline and Power Pro and Kevlar. One blade is finely serrated to grab onto the line as you cut it, and hold it in place. These High Durability Shears are for cutting metal - up to 0.8 mm - and solder. These Tweezernose pliers have tiny, 1.48 mm, tips, small enough to get in there and squeeze down those annoying ends of wraps on earrings and dangles. We suggest hiding them, writing your name on them, or embellishing the handles with nail polish to prevent you-know-who from absconding with them. Either that, or buy them a pair too. And last, but most certainly NOT least - these Micro Shear Flush Cutters WITH RETAINER are da bomb, or the bees' knees, depending on your generation. (Bee's knees or Bees' knees? All the bees, or just one bee?) Anyway - the retainer grabs the end of the wire as you cut, and bingo - no small piece of wire zipping across the room to lodge in the carpet and lurk there, waiting for unsuspecting bare feet (or knees, bee's or otherwise). No awkward hand repositioning to catch the wire - just "snikt" - your wire is cut, and the end is still there. WooHOO! There are even some inspirations that come up in the search, like this oldie but goodie, Emerald City. I am going to have fun with this colour of the year!!!! We're winding down the year with two more fabulous classes. Want to sell your creations? Perhaps it is piling up around the house, all your friends have all the jewelry they can ever wear, and now you are wondering what to do? Or maybe you would like your hobby to pay for itself? Or maybe you would just like to throw off the shackles of the corporate lifestyle and go out there on your own doing something you love? Whatever the reason, if you are considering selling your jewelry — you owe it to yourself to take this course. 3. Product: Making it is the easy part of business! Learn this Pandora style braided cord technique to show off those special one-of-a-kind lampwork and metal clay beads and pendants. 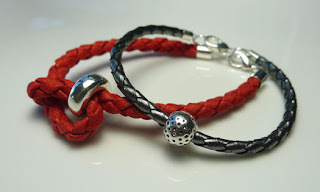 This technique can be used with a variety of materials to create a range of looks from the delicate to bold man-jewelry. Wouldn't these be great for Holiday gifts? Surprise! - It's a Merry Holiday sale! Sparkly Wheels and So Much More!